Let’s talk about bed letters. (Did I just make a “bed wetters” pun? Gross, I did). Now that we’ve all moved past my fourth grade humor, let me tell you why. It was the perfect way to introduce the answer to a question that we’ve been asked a lot lately: What’s in those three frames above your bed? The answer: “J and S.” Call it a monogram or, more functionally, our designated sleeping arrangement, but either way this fun little take on our initials was all Sherry’s genius. She simply found three differently designed letters (a curvy spiral staircase inspired J, a sign language A-N-D and an architecturally drawn S). Then she framed them separately above our bed to fill that long, awkward space under our long, awkward window. While we’re on the topic, the opposite side of our bedroom boasts another three-framed art piece. And this one’s my creation. Back when we first painted the bedroom blue, we looked for some “warm” art to cozy it up. We struck gold with a sunset photo I took in Santa Monica on our very first vacation together. Having only struck metaphorical gold, however, the three-frame design was actually inspired by our tiny budget. 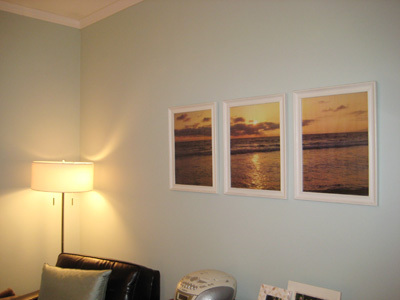 Sizing the image across three 11″ x 17″ Ikea frames was the economical way to create big impact on that wall, especially since we got the images printed at Kinko’s for cheap (around 50 cents each). And now every morning we wake up to the sun and the sea. It’s like an ocean view on a budget. Despite both being simple projects, they’re two of our favorites – and have literally hung in there for almost two years. Which is practically a lifetime considering how often things change around here. What great ideas! I love them both. I might have to go digging in some old photos to see if I have something suitable! So glad that you like our little art ideas. We actually do a lot of framing around here (from keys to sea fans to maps to everything else in between). Stay tuned for those posts… coming soon. I’m totally a letter/font dork too, Kelly. And your wall art project is looking awesome. Can’t wait to see the finished product, which I know your parents will love. Sure thing, Lori. Sorry to have left that out. They were printed on three separate pages. If my memory serves me, if you try to print anything larger than 12″ x 18″ at Kinko’s you get bumped from their normal, inexpensive printers to their expensive plotter printers. Since we didn’t want that extra cost we split the image ourselves using Photoshop and brought the three JPG files to Kinko’s on CD. They printed them for us on regular 11×17″ printer paper stock, so total cost was less than $5. Love the monogram. Absolutely a genius idea. Where did you find teh monogrammed letters?? I’ve been Googleing and can’t find anything as cute as yours! We actually created our own line of mix & match monograms that we sold in our shop but because everything we make is limited edition we no longer sell them. So sorry! You could try etsy.com though, they might have something awesome. Hope it helps! I have just discovered your site through Healthy Tipping Point and as a new home owner I am loving the tips and hints and plenty of ideas. I particularly love the idea of Bed Letters. However, my partners initial is B while mine is O. Not the prettiest of monograms! I might stick to our last names. Thanks for all the ideas. I will definately be adding kokokara to my list of sites to visit regularly. I absolutely love you guys!! I love the monogrammed idea and have been looking online for the longest time to find cool ones like the ones y’all have but sadly I cannot. My husband and I just bought our house in Anchorage AK and I have been a fan of your site for years now. I’m using a lot of the projects you guys have done to do awesome things in my home. I realize I’m a little late to this party but I was wondering if you remember where you found the sign language silouttes? I have been looking all over the net and can’t seem to find anything nice enough to hang up. I appreciate any direction you can give me! I just used google images and probably searched “sign language” and cut and pasted the letters “a” and “n” and “d” together to create that print. Good luck! I am a new fan of this website and absolutely love the initial idea. Being in a financial crunch has made decorating difficult, but this is not only cheap, but gorgeous! As a 63 year old great grandmother I must say I would have loved having such a wealth of wonderful information available to me when I was a young wife and mother. I do sew but wanted to see your nursery curtains and goodies. My granddaughter does not sew and I can hardly wait to tell her about your blog. She will love all the money saving ideas, projects that she can (and will)love to to tackle. I admire greatly the love and humor that you so freely share with your readers. I love the Symmetry on the top one. Santa Monica does have great sunrises. Love the monogram. Great idea! “Which ever you want it to be Erica,” he answered. I always remember that about my father in law. You can tailor the letters to the persons personality. Fun! yeah, I just made a ” bed letter ” , My room is so nice now, thank you for sharing your post.